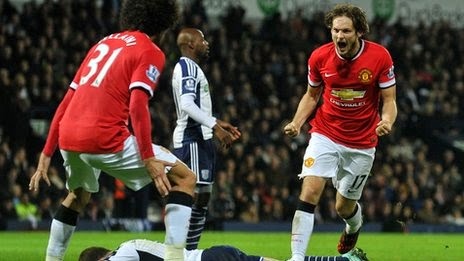 Daley Blind's late goal salvaged a point at West Bromwich Albion but could not end Manchester United's winless run away from home under Louis van Gaal. United trailed early on when Stephane Sessegnon fired a stunning opener, but half-time substitute Marouane Fellaini levelled within minutes of coming on. Saido Berahino restored the home advantage with a curled finish. But United rallied, with Robin van Persie striking the post before Blind extended their unbeaten run to three.